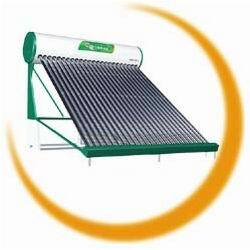 Solar Water Heater from a Chinese professional Solar Water Heater manufacturer. 1.For the sake of safety and environmental protection, we recommend "Duke II", a stainless tank integrated with a solar energy heating unit supported by a aluminum alloy frame. 2.Product Standard: φ470×φ58×1.8m,or φ420×φ47×1.5m, can be customized upon customers special requirement. 3.Exports are general type and super-conduct heat pipe series. 4.For the difference between general solar product and super conduct one, please refer to related material. a)vacuum tube is made of 3.3 high boron silicate glass wall thickness1.6mm, vacuum degree=5×103 Pa , hail-resistance(hail diameter≤25mm), lowest working temperature: -25.
b)water tank: both inner and outer are made of 304/2B stainless steel, with a 0.4mm-thick internal and external bladder, all joints argon arc welded to form good anti-oxidation. Insulation layer is made of one machine-blowing polyamine ester,with a thickness of 55mm, density of 35kg/m and , obturator foramen rate98%. It turns out to achieve best heat preservation. c)Supporting: made of surface-oxidized aluminum alloy which guarantees strong anti-oxidation and a service life more than 10 years, thickness of main supporting stick 2.5mm. d)Metal heat pipe:mainly made of electrolytic copper,foreign heat-transmitting working substance, elaborately made,the best heat pipe in China, characterized by its good diathermancy through vaporization even under-38 without releasing condensed air,heat output power120W as much as 180W.output power of high quality vacuum tuve80Wgood anti-freezing performance,naked pipe can bear20, diathermancy is 1000 times that of pure copper. e)Metal super-conduct heat pipe: vacuum pipe+ aluminum sheet +metal heat pipe+ silicon rubber plug. This internationally-leading innovation by our company guarantees compactness and non-explosion of used pipes. Such new pipe gets a tri-layer vacuum safeguard with a daily efficiency more than 58% (national standard is 45%), average heat loss quotient is 1.6W/ (m2) (national standard is 2.0W/(m2). This pipe unit can resist temperature as low as50. 6.Metal super-conduct heat pipe assembled with above parts is of high quality, which guarantees users a safe and comfortable operation. 9.All parts are packed by seven-layer brown paper. Special requirements, please contact us.